The word tea comes from the Chinese language and in Mandarin, it is called “Cha” (see left image). There is a word for tea in most languages and it is interesting to follow the origins of it in the different countries. Tea was brought to Europe first by Dutch traders. They came in contact with tea through Chinese traders in Java who came from the southern port of Amoy (Xiamen today). 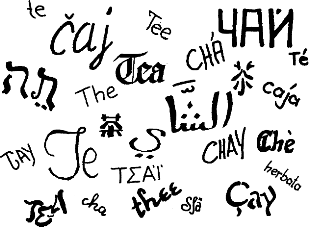 In their dialect, the word for Cha is Te which is pronounced like tay/day. Most European countries imported their first tea from the Dutch and with the tea, they took over the name too. Therefore the word for tea is similar in most European languages except Portugal. The tea leaves came through Jesuits monks directly from China, and the Portuguese word for tea is chá. Other parts of the world come in touch with tea through overland trade. Caravans brought their goods along the silk roads which led through Mongolia, the Slavic-Indian area to Arabia. In those countries the word for tea is very similar to the Chinese Cha or only slightly different. It would be technically incorrect to say fruit tea or herbal tea because they are not “real” teas (often called infusions, tisanes, etc.). However the colloquial English today does not make a distinction between them. As long as something is brewed out of leaves, roots, fruits, seeds, flowers, tree bark or something similar, it is called tea.